LIAR, TEMPTRESS, SOLDIER, SPY tells the spellbinding true story of four women who risked everything—their homes, their families, and their very lives—during the Civil War. Seventeen-year-old Belle Boyd, an avowed rebel with a dangerous temper, shot a Union soldier in her home and became a courier and spy for the Confederate army, using her considerable charms to seduce men on both sides. Emma Edmonds disguised herself as a man to enlist as a Union private named “Frank Thompson,” witnessing the bloodiest battles of the war and infiltrating enemy lines, all the while fearing that her past would catch up with her. The beautiful widow Rose O’Neal Greenhow engaged in affairs with powerful Northern politicians, used her young daughter to send information to Southern generals, and sailed abroad to lobby for the Confederacy, a journey that cost her more than she ever imagined. Elizabeth Van Lew, a wealthy Richmond abolitionist, hid behind her proper Southern manners as she orchestrated a far-reaching espionage ring—even placing a former slave inside the Confederate White House—right under the noses of increasingly suspicious rebel detectives. Karen Abbott's pulse-quickening narrative reads like the finest fiction, seamlessly weaving the adventures of these four heroines across the tumultuous landscape of a broken America, and evoking a secret world that will surprise even the most avid fan of the Civil War. 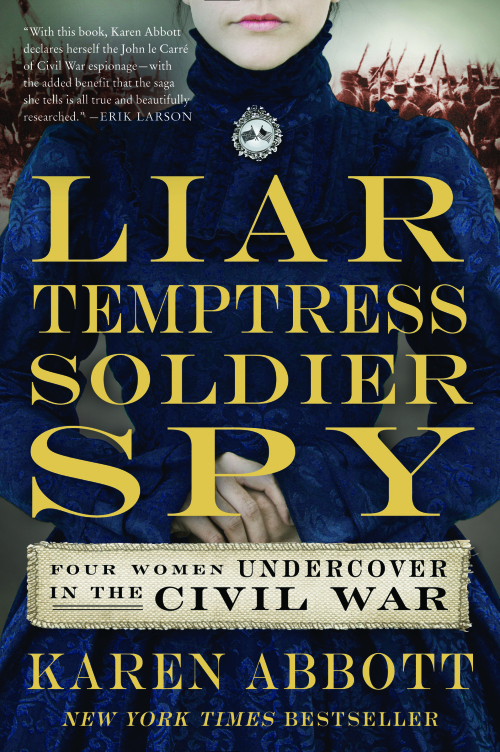 With a cast of real-life characters including Walt Whitman, Nathaniel Hawthorne, General Stonewall Jackson, detective Allan Pinkerton, Abraham and Mary Todd Lincoln, and Emperor Napoleon III, LIAR, TEMPTRESS, SOLDIER, SPY draws the reader into the war as these daring women lived it, constantly courting risk and raising the stakes, and not one of them ever quite what she seemed.